A tiny minority of London motorists get grumpy with cyclists if we don’t move over to the far left of the lane. When cyclists are in the middle of the lane, drivers can see them more quickly and are more aware of them. Cars sometimes pull out from side roads and driveways into the road without noticing that there is a cyclist on the inside. If the cyclist is in the middle of the lane they have more time to swerve. Pedestrians sometimes step off the pavement into the path of bikes. This has become worse as more pedestrians wear headphones and are less aware of who is on the road. People sometimes open car doors into the path of cyclists. (Have you ever seen a cyclist being “doored”? I have. Not nice.) That’s why TFL recommends that cyclists are at least a car door’s width away from parked cars. Some cars and lorries turn left without realising that there is a cyclist on their inside. That doesn’t happen if the cyclist is in front of them. The side of the road often has drains and manhole covers that are slippery. Detritus from the road (broken glass, garbage) gets washed from the road towards the gutter. That makes it dangerous for cyclists. Some car drivers think they can overtake cyclists who keep to the left of the lane even when there is oncoming traffic, creating a dangerous situation for everyone. If the cyclist is in the middle, car drivers have to wait until they can overtake safely. The law does not require cyclists to use the side of the lane. Nor does it require cyclists to use bike lanes, where they exist. 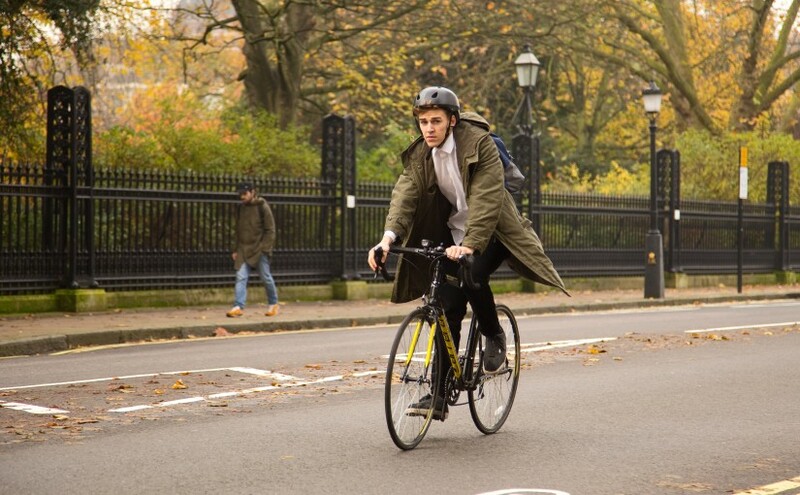 Like other road users, cyclists should cycle in the lane in a position that is safe and convenient for them. Some car drivers grumble that cyclists slow them down by cycling in the middle of the lane. That’s sometimes true (but probably cyclists slow the traffic down less than if we were all in cars). And it works both ways: cars also slow down cyclists. That’s how it is when you share the road. Most car drivers understand why it is safer for everyone if cyclists use the middle of the lane, rather than clinging to the gutter. 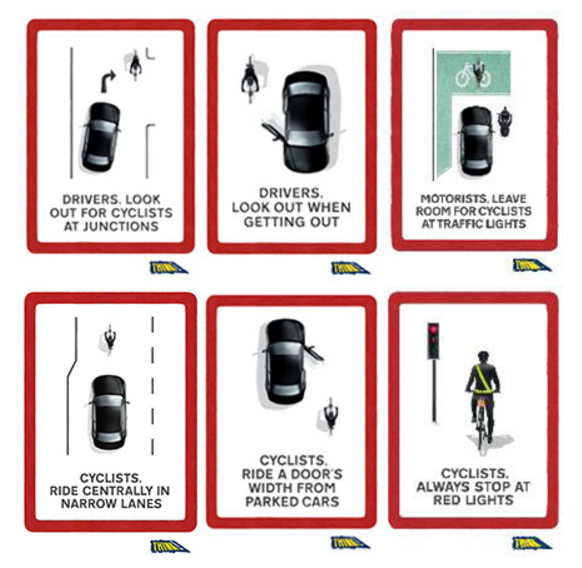 But some drivers – perhaps especially those who have never cycled – may not understand the reasons we do it. We don’t hold our lane to annoy car drivers, but because, like everyone else on the road, we want to get to where we are going safely. Let’s all show each other a little more understanding. When cyclists wish to turn right (left here in the USA), they can safely come to a stop if needed and turn without having to cross an extra lane of traffic coming behind them. On a related note, even though they have (and recognize) a bit of a funky sample, I found this study on comparing people’s interpretation of the signage “Share the road” vs “Cycles may use full lane” interesting. It suggests the “Share the road” message provided no additional comprehension over no sign, and that “Cycles may use full lane” did a better job of delivering the message about where bikes can be. In California bikes must use the bike lane when traveling slower than “traffic” (cars). Then they must also ride as far to the right as practicable. As a no longer cyclist this is OK by me, but I did tell my son when he was learning to ride in traffic, “take the space you need, be predicable, don’t be a jerk, and most important, DON’T ride in the door Zone. California law now requires motorists to pass bikes no closer than 3 feet. For me some seconds delay due to being slowed by a cyclist on the way to the next red light is not a big deal. Is it illegal for in the US to use the main road if there is a cycle lane? The only country in Europe where it is mandatory to use a bike lane, if there is one, is Belgium. Previous Previous post: Will we be the first generation to eradicate malaria?